[miau] Happy Birthday to the gamer who chooses this entertaining slot machine to play. Full of festive symbols and great bonuses, this game is sure to entertain all. With all of the important elements of a birthday party, this game is sure to excite and entertain gamers who love birthday cash and online slots. The background is adorned with balloons and streamers on the upper sides and presents on the bottom corners. Above the reels there are three windows that display the amounts of the gold, silver, and bronze jackpots. Directly under is the playing screen displaying the reels and pay lines. At the bottom left is a heart shaped icon for information about the game. 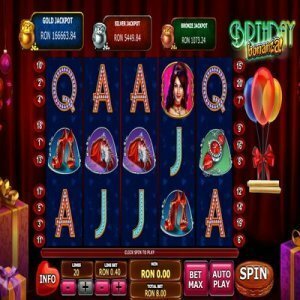 To the right are the control icons for such things as how many lines are being played, how much is wagered on each line, the win window, the total bet window, a maximum bet button, an auto-play button, and the spin button. This slot has five reels that contain a variety of icons. The reels all spin independently. There are twenty pay lines for placing wagers. The reels have an assortment of icons that represent different payouts. There are such things as a girl, a watch, a handbag, stylish shoes, and the letters J, Q, K, and A. The minimum amount of lines that can be played on this game is one. The maximum amount of lines that can be played on this game is 20. The minimum bet is one cent and the maximum amount that can be bet on one spin is $200. The maximum jackpot is a 500x winnings multiplier. The Happy Birthday bonus is a randomly awarded win that is indicated by the icon entering onto the screen and doubling any awarded wins. This bonus is triggered before the spin button is activated. The Surprise Party bonus is awarded randomly before a spin. This icon will appear on the screen and will multiply the amount of current winnings by three, four, five, six, seven, or ten times the amount wagered. The Birthday Present bonus is activated when three or more wild icons appear on screen. This bonus has three different levels of play which ultimately lead to the progressive jackpot. The levels of this bonus round are played by choosing presents from a group to open. If the player successfully opens all of the boxes without revealing the empty boxes, they will progress to the next round until they reach the progressive jackpot. Here the player will uncover three pots and choose one, revealing the payout. When it comes to throwing a fun filled party, the Birthday Bonanza Slot machine will get it started. Play this online festive and entertaining game on a variety of devices. It can be a birthday party anywhere at any time.